This is the first video in the history of planet Earth where Paul Fromm and Brian Ruhe made a long distance video by Skype, on June 4, 2016. Paul has been the director of the Canadian Association for Freedom of Expression (CAFE) since 1983 and this is the next in a series of videos on the McCorkill case. __ Here’s my donation of ____to help CAFÉ’s support the victims of state censorship, especially Arthur Topham. __ Please renew my subscription for 2016 to the Free Speech Monitor ($15). Fredericton, New Brunswick. June 18, 2015. A three judge panel of the New Brunswick Court of Appeals reserved its decision in the McCorkill Will appeal. Panel chairman Judge Kathleen Quigg said: “We are going to try to do it as quickly as possible but it also must be translated (into French). It will take a couple of months.” Experienced court observers predicted a six month wait for the decision. “This case is crucial for freedom of speech and freedom of beliefs and for property rights in Canada,” said Paul Fromm Director of the Canadian Association for Free Expression in a statement before the appeal began. The late chemistry professor William McCorkill left the bulk of his estate consisting of old artifacts and rare coins, variously estimated at between $150,000 and a million dollars, to the U.S.-based White nationalist National Alliance. The will was probated in 2013. When the information became public, a Montgomery based censorship group called the Southern Poverty Law Center complained that the bequest would revive Nazism. The SPLC had no standing in Canada, but Ottawa lawyer, copious human rights complainant and loud anti-racist Richard Warman took up the cry and announced the will should be nullified as the bequest was “contrary to public policy.” Isabelle McCorkell *yes, different spelling), the long estranged sister of Robert McCorkill, who had taken no part in the nine year probate proceedings emerged and made an application to nullify the will on the grounds, get this, that it was “contrary to public policy.” Quickly the Attorney General of New Brunswick, the Centre for Israel and Jewish Affairs and the League for Human Rights of B’nai Brith intervened in support of this brazen attack on property rights. The Canadian Association for Free Expression intervened to support the lawyer for the trustee, John Hughes of Moncton, and to support freedom of belief, freedom of speech and property rights, specifically, the right of a testator to direct his estate as he sees fit. The bulk of the work of an appeal is in the written submissions presented to the Court. The actual appeal hearing allows each party to highlight their best arguments and the judges to question and challenge these arguments. CAFE’s lawyer Andy Lodge explained: “We are here today because the Court of First Instance found the National Alliance, the beneficiary of the the gift to be unworthy. This is a ground breaking precedent. There are no conditions in the bequest. Some of the evidence in the affidavits [there was no viva voce testimony] was double hearsay. There was no previous case law to rely on. The goals and objectives of the National Alliance should not be in question. 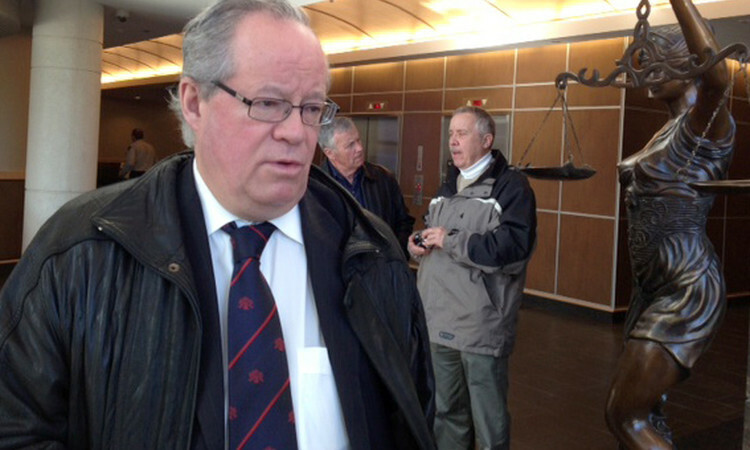 Mr. Lodge was repeatedly interrupted by questions from Judge Alexandre Deschenes. “These cases would be very rare,” Judge Quigg suggested. Fredericton, NB., June 18, 2015. “To render a judgement against a group from another country because of its character is an insult to the U.S.,” he added. “Where do we get the authority our own public policy” to a U.S. group?” Mr. Justice Deschenes asked. Continuing, Mr. Hughes said: “The Executor has asked me to express the point that. Justice Grant may have been biased” in freezing the assets of the Estate and money due the National Alliance and my accounts. He could have entertained a review of the passing (or unfreezing of the assets) of my accounts, but he postponed it until after this appeal.” The lack of funds had restricted Mr. Hughes ability to act. “But there is no precedent on this issue,” Mr. Justice Deschenes interjected. Please consider making a contribution to help CAFE pay its bills in this crucial appeal defending free speech and property rights. __ Here’s my special donation of _____ to help CAFE pay off its legal bills in the McCorkill Will Appeal to be heard in New Brunswick this month. __ Please renew my subscription for 2015 to the Free Speech Monitor ($15). St. John, New Brunswick. January 28, 2014. Lawyers defending the right of a man to will his estate to a controversial group had their day in court today. At the end of this morning’s session before the Court of Queen’s Bench here, Judge Grant reserved decision about a motion brought by Isabelle McCorkell, sister of the late Professor Robert McCorkill who had willed his collection of antique coins and artefacts to the U.S. National Alliance. However, before the free speech lawyers defending the bequest were heard, the third of three interveners advocating the nullification of the will addressed the court. Danys Delaquis, representing the Centre for Israel and Jewish Affairs, said: “CIJA opposes anti-Semitism, racism and discrimination. There is no room for any Jewish person in the White space the National Alliance seeks to create,” he complained. “If the bequest is not voided it will be detrimental to the Canadian Jewish community,” he added. “The Peel Board of Education had found the National Alliance to be ‘a well known White supremacist organization.’ Therefore, it would be quite reasonable for this court to make this finding of fact as was done in a grievance terminating Mr. Fromm as a teacher.” A late CIJA affidavit from one Simon Fogel smeared CAFE director Paul Fromm in an ad hominem attack. Mr. Fromm is not a beneficiary in this case. The grievance finding had merely restated accusations about the NA. The grievance board had never investigated the NA. CAFE lawyer Andy Lodge being interviewed by press. There are no redeeming qualities in the National Alliance in regard to Canadian public policy,” he insisted. “The National Alliance excludes an entire people from its White space. This is repugnant and offensive. The public interest must outweigh the wishes of Mr. McCorkill. Can the Court allow a testamentary gift to stand that is contrary to public policy?” he challenged the judge. “The National Alliance,” he explained, “is described as an incorporated company in the State of Virginia, with an office in West Virginia. There is no evidence the National Alliance has violated any U.S. law and it remains a U.S. corporation in good standing. There is no evidence the National Alliance was ever convicted or charged with an offence in either the U.S. or Canada. Is the NA duty bound to obey the law of any country but its own?” he asked. And, he continued, “even if a person is charged with a crime that does not disqualify him from receiving a bequest.” He pointed out that in the very few precedents where the court did nullify a section of a will it was because of the language of the will; for instance, the much referenced Wishart horse case, where the will mandated the shooting of the horses. “Would my learned friends be here today if the money had been given to Mr. Gliebe?” he asked. “If the courts allow the examination of the character of beneficiaries, where is the certainty in counselling a client on the drafting of his will?” he wondered,. “That is what Isabelle McCorkill is doing here today, trying to get more money,” he charged. “Whether the National Alliance’s values are congruent with the values of Canada should not be the issue. Allowing this applicant to succeed by assailing the character of others should not be permitted,” he concluded. SAINT JOHN – A Court of Queen’s Bench judge has reserved his decision on whether a Saint John man’s will is legal and can bequeath about $250,000 in rare coins and antiquities to an American neo-Nazi group. Harry Robert McCorkill left his estate to the National Alliance when he died in 2004. A decade later, his sister, some rights groups and the province of New Brunswick went to court to prevent the money from flowing to the white supremacist, anti-Semitic organization. There’s little case law on the subject and in many ways, the debate around the McCorkill estate is unique and breaks new legal ground. Dan Delaquis, a lawyer for the Centre for Israel and Jewish Affairs, told the court Tuesday that the gift, if it’s permitted to stand, will be “detrimental to the Jewish community” and will result in an erosion of Canadian values because the National Alliance has a mandate of hate and is a well-known white supremacist group. “We submit in this case that the public interest must outweigh the wish of Mr. McCorkill,” he said. Marc-Antoine Chiasson, a lawyer for Isabelle Rose McCorkill, argued that one need only look at the National Alliance’s own handbook to see firsthand how it purports a racist message. He read excerpts of the small handbook in court on Monday, highlighting how it points to “white” living spaces with white schools and residential areas with the overall view to create a white world. Chiasson also pointed to the words of National Alliance founder William Luther Pierce and described his books, Hunter and The Turner Diaries, which were written under the pseudonym “Andrew Macdonald,” as repugnant. But Andy Lodge, a lawyer for the Canadian Association for Free Expression (CAFE), told the court Tuesday that the fact that an organization may be considered “morally reprehensible” should have no impact on whether it can be a beneficiary of an estate. He pointed out that there are no laws prohibiting even a serial killer or a drug dealer to receive assets from a will. He said it would do more harm than good if the courts started assessing a beneficiary’s past or try to predict how they would spend the money they receive from a will. Lodge described the court debate over McCorkill’s will as an “exercise in futility.” He argued there is no legal basis to challenge the will because it’s valid, follows New Brunswick’s Wills Act and contains no words that are contrary to Canada’s public policy. The lawyer said he knows of no law that would prohibit a living person in Canada from giving money to the National Alliance. John Hughes, the lawyer for the executor of the estate Fred Streed, argued that the application to prevent the disposition of McCorkill’s estate to the National Alliance should be dismissed. Isabelle McCorkill didn’t attend the trial in Saint John nor did any representative from the National Alliance, a West-Virginia based organization. Chiasson, her lawyer, has said that the legal battle over her brother’s estate has never been about the money, but rather, about preventing it from going to a neo-Nazi group. Catherine Fawcett, who represents the League for Human Rights of B’nai Brith Canada, also argued that the gift to the National Alliance is “completely against public policy” and pointed to the connection between hate propaganda and violence. McCorkill’s estate includes, among other items, a collection of hundreds of Greek, Roman, and Italian coins – some dating back to 525 BC – that he amassed since the 1970s. Some items were once displayed at the University of Saskatchewan’s Antiquities Museum and a release from that institution in 1997 described him as a well-travelled collector and a chemist who spent time at MIT and the Smithsonian Institution. Little else is known about the man or why he lived in Saint John, where he moved about a year before his death. He lived quietly in a townhouse in Millidgeville and after he died at home in 2004, his body remained at the Saint John Regional Hospital for nearly two weeks while the authorities tried to track down his next of kin. The National Alliance paid for his funeral and hired Malcolm Ross and William Ross of Moncton to transport, store and take inventory of his assets. Malcolm Ross, who attended McCorkill’s court hearing in Saint John on Tuesday with his brother, was the focus of a 1996 Supreme Court ruling that found that the former Moncton-area teacher whose off-duty writings claimed Christians were under attack by an international Jewish conspiracy, had in fact “poisoned” the educational environment. The ruling upheld a human rights board of inquiry that ordered Ross into a non-teaching job. Outside court, he told the Telegraph-Journal that he was there to “observe,” but declined to comment on his connection to the McCorkill matter.